Disney SPECtacular brings the magical world that Walt had envisioned since the inception of Disneyland right to the heart of towns across the United States. 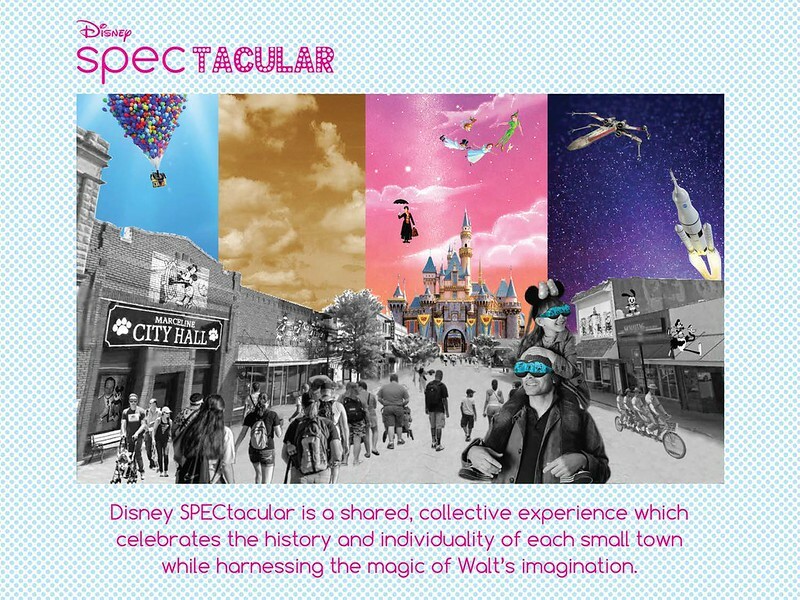 Families and friends will rediscover their hometowns anew using “Magic Specs” to reveal the magic of Disney permeating through the existing. Disneyland is re-imagined uniquely in each small town. 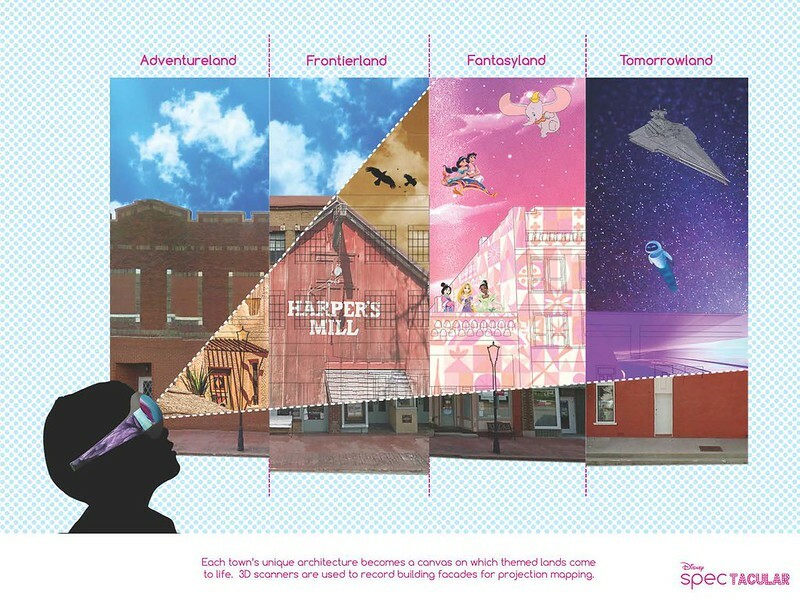 Building facades function as canvases for projections of Adventureland, Frontierland, and Tomorrowland, which are visible through Magic Specs, magical oculus devices. When Walt created Disneyland, he imagined a magical world that families and friends could explore and enjoy together. To do this, he created the amusement park, an enclosed and controlled simulated environment of family attractions and magical realities. Soon, cities across the country began contacting Walt, eager to open their own Disney parks. But Walt didn’t settle on building another Disneyland. His vision for this magical world extended beyond the gates of Disney theme parks. He wanted families to be able to access the hidden magic coexisting all around us. He began researching a multi-sensorial device that would allow people to see the magic. The investigation that began with Walt has finally come to fruition through “Magic Specs,” an oculus device that allows families and friends to experience the untapped magic of Disney in their hometown. Guests put on their Magic Specs to reveal the fantastical world of Disney SPECtacular. Entering through Yesterland, the world appears in black and white, and guests can learn about the history of their town through interactive projections. Beyond the holographic castle exist Disneyland’s four distinct lands – Adventureland, Frontierland, Fantasyland, and Tomorrowland. 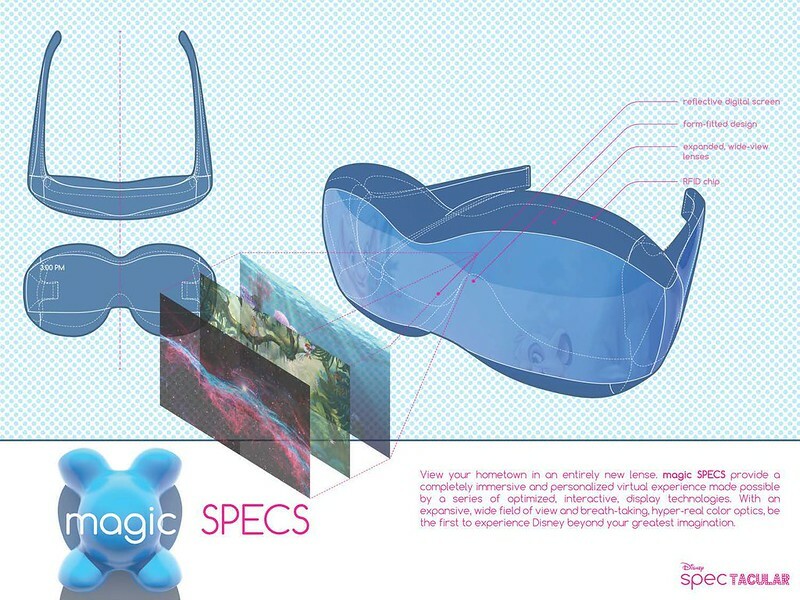 Virtual reality, visible through Magic Specs, is an opportunity to add sensory layers to the environment – from dreamy pink skies in Fantasyland to X-wings flying over Tomorrowland. 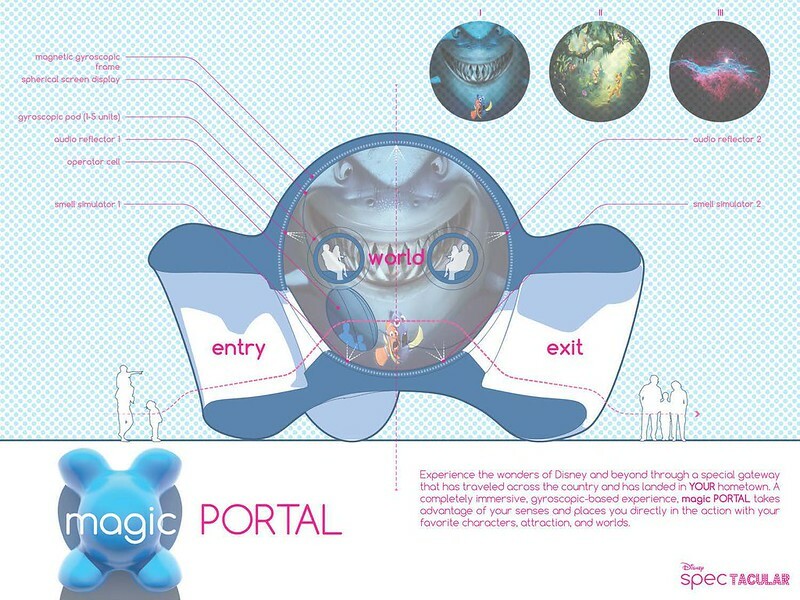 Guests can experience classic Disney attractions in an immersive, four-dimensional environment through the implementation of Magic Portals. Favorite attractions like Dumbo the Flying Elephant and Jungle Cruise are reinterpreted in a 360-degree simulation experience. Each evening ends with Walt’s signature “kiss goodnight” – a fireworks projection SPECtacular! Magic Portals – compact, transportable simulators – utilize a 360-degree spherical screen to realize classic Disney attractions four-dimensionally. 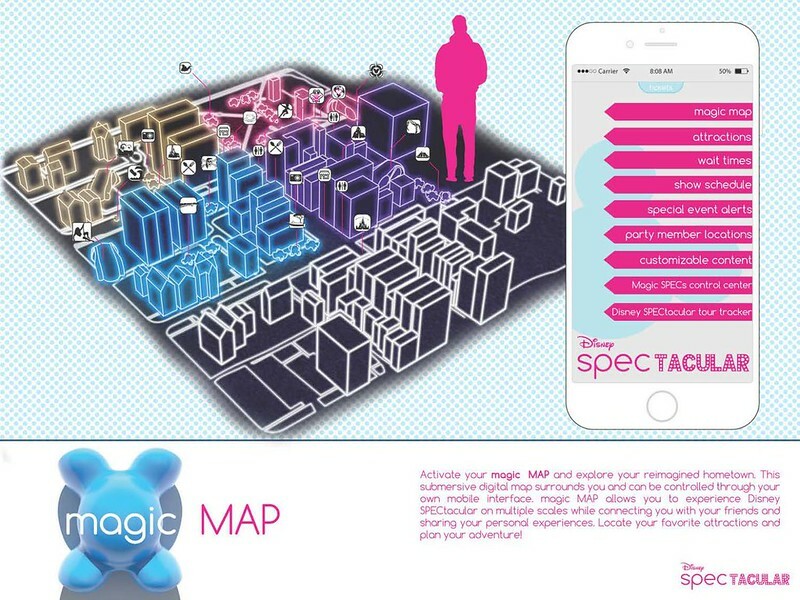 Magic Map is the interface between the digital and physical environment. The mobile app allows guests to customize their adventures while staying connected with family and friends. Disney SPECtacular embodies Walt Disney’s appreciation for the nostalgic and confidence in the future. The project was conceived by the UCLA A.UD Team and created for the 2016 Walt Disney Imagineering’s Imaginations Design Competition. This project is the sole property of Walt Disney Imagineering and all rights to use these ideas are exclusive to Walt Disney Imagineering. The competition is a way for students and recent graduates to showcase their talents and for Walt Disney Imagineering to identify new talent.